Subscribers get real-time trade alerts and volatility updates. To subscribe, click the link in the above menu. The newsletter is released weekly on Tuesday evenings. A sample is provided in the menu link. Posted in: Uncategorized. 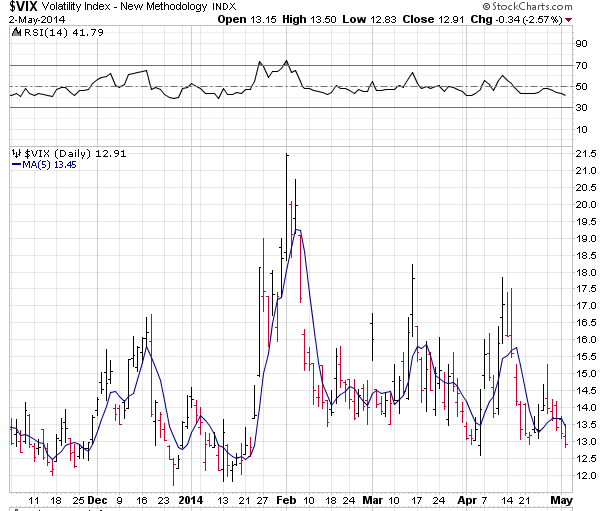 Tagged: VIX, Volatility, VXX. Posted in: Uncategorized. Tagged: spy options, uvxy, VIX, Volatility, VXX. I want to thank all the subscribers that have signed up for the newsletter and trade alerts. All of the trades in Tuesday’s installment are working, and I hope you have taken advantage of the trade alerts as well. 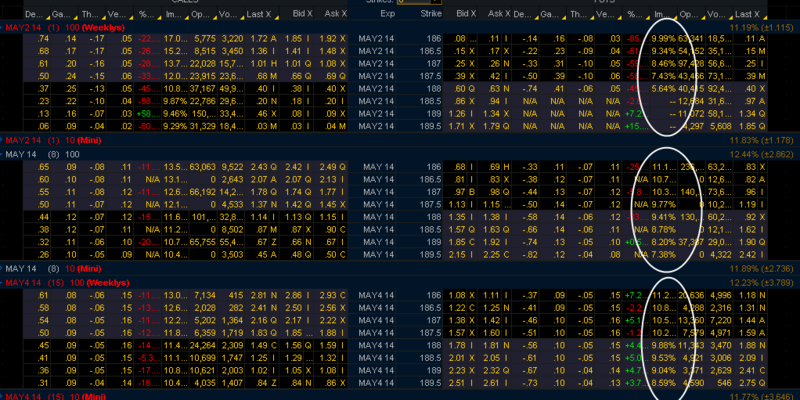 These are the stats for the SPY options today. When the SPY was getting nailed, folks SOLD puts and bought calls. More puts were sold than bought and more calls were bought than sold. That is a recipe for a lower VIX, without a doubt. This implies that no one believes that the S&P 500 can actually fall more than a certain amount before dip buyers will arrive. And you can’t blame them, that intraday buy-the-dip trade has seen it’s share of stick saves of late, which are often accompanied by a gap up the next day. When someone else has your back, why worry about selling the tiniest of volatility premium when it shows up? But when something gets too easy in the markets, eventually it gets taken away or at least burns a bunch of folks to teach them a lesson. Selling puts like this can be hazardous to your health, maybe not today or tomorrow, but it will catch up to you eventually. Actually, if you bought it at the open, you could have made 500%. That is what happens when there is no juice in the options. So, while the market is underpricing volatility, that doesn’t mean that you can’t own it in other ways, and this is a prime example. 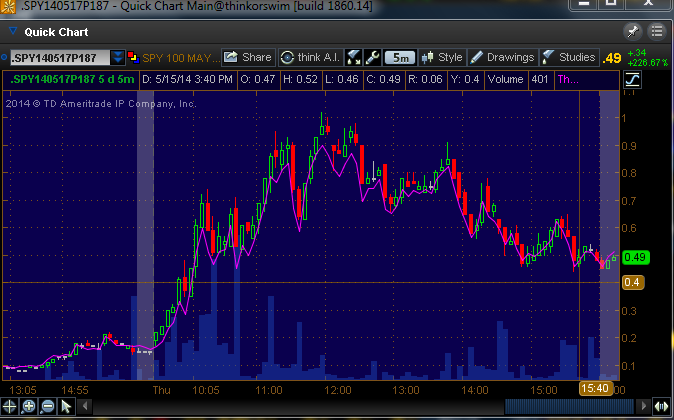 This is a long vol trade without using VXX or VIX. We may have more trade and volatility email alerts tomorrow, if you are interested, the newsletter link is in the above menu. Tuesday evening I will publish the first Volatility Analytics newsletter. A link to a sample is below. I’m sure it will change and improve over time, and your feedback is very welcome on not only what you want to see, but how it can be improved. I will be emailing volatility updates, probably more often when volatility hits extremes. Also, I will email subscribers shortly after I put on trades or see asymmetric risk/reward opportunities. If you like what you read, the link to subscribe is in the menu above. 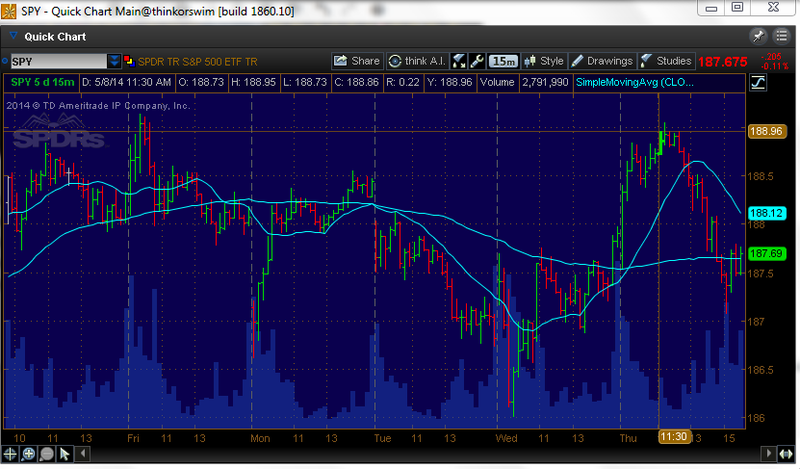 The SPY was able to reclaim the 10 day moving average as well. 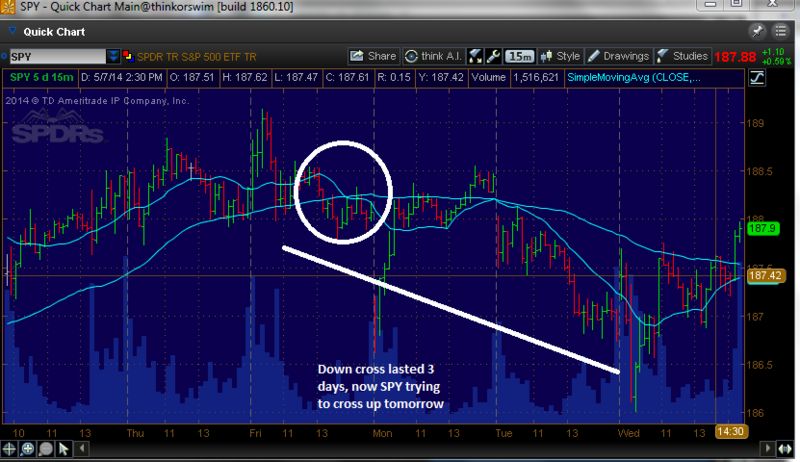 We are nearing some kind of inflection point it appears, as the 10 day and the 50 are near a cross. If you see the 10 cross through the 50, get ready for the knuckleheads on CNBC to be trotted out with their “death cross” prognostications. 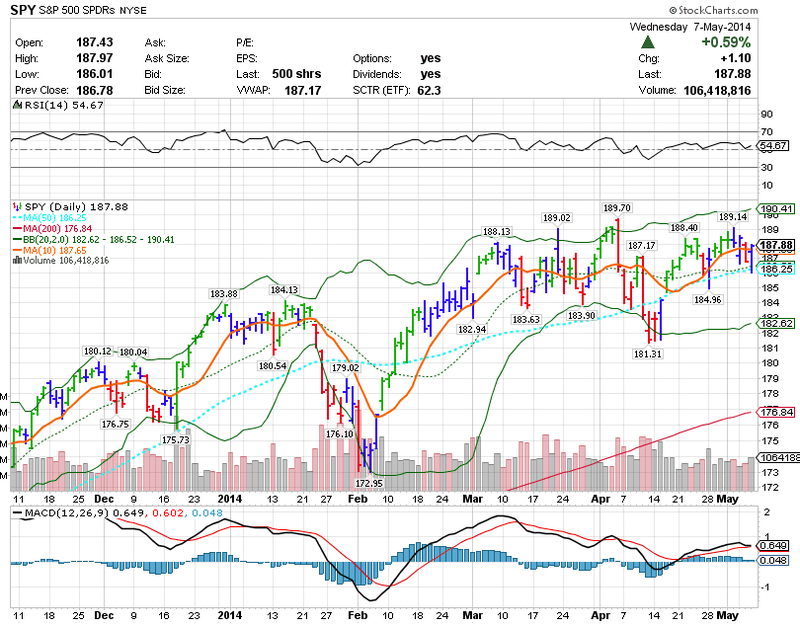 The Nasdaq and Russell 2k look sickly, and the Rut2k barely recaptured the 200 day moving average. That is a big one. As you can see, prices at these levels don’t hang around forever. This is the time to prepare, however you see fit. I will be watching closely, and if I can sell some UVXY and VXX spreads a few weeks out or purchase some in the money calls in VXX at prices anywhere near a VIX future of 14Â then I will be doing so. I will go out to May 30 or even June. Most folks just wait for volatility to arrive before doing something; it is my preference to be a little bit early rather than late. Friday might be the day to put on some positions, as we are nearing a 8/34 cross on the 30 minute chart, and that can support a bullish market Â for hours/days ahead if it can get there. A bullish day tomorrow and I will be on the sideline, being patient. As you probably know, I almost never buy VXX calls, but this set-up is fairly rare and is occurring with seasonal difficulties, earnings ending, and divergences showing up in many areas. Patience is warranted though, you are probably not going to wake up one day and see the market down 25 S&Ps. 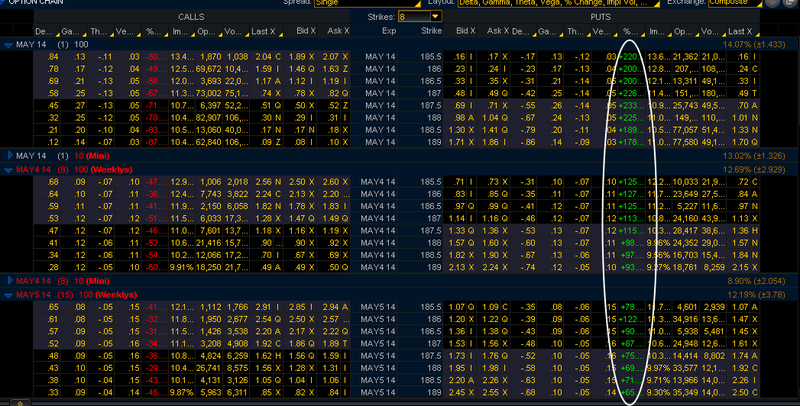 I do already own some VXX May 30th $38 calls and am short some UVXY May 16th $48-47 put credit spreads. You really can’t ask for much more in VXX. 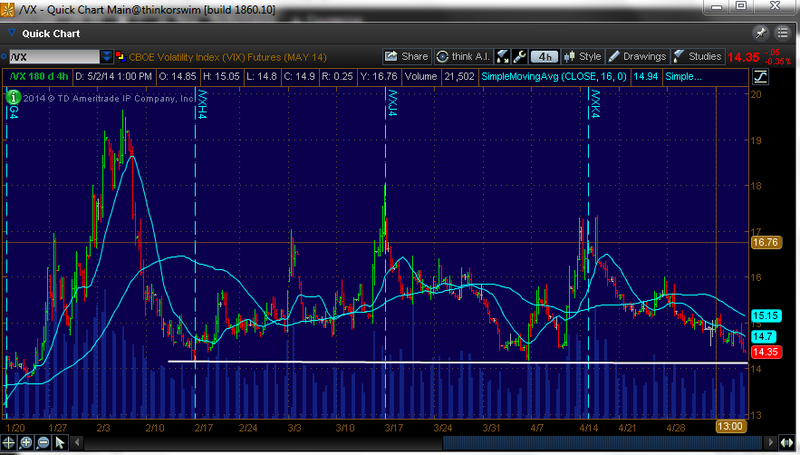 So often the VIX futures sit in a range where they are untradeable, usually when the VIX is in the 14-16 area. In those cases, getting long volatility could eat you alive, yet getting short could get you killed. This is not one of those times. There is a flow to these spikes, no? Granted this is only 2014 right here. But go back to last year and the year before that and you will find that this rhythm persisted then too. I don’t ever look at volatility like folks out there on CNBC and stocktwits, trying to get ready for the next crash, that is wasting precious time and money when you can take what the VIX gives you over and over again. Sure, if there is a crash, I’ll be happy to ride that too, but realistically, we deal with the market we have, not the one that we may want. May 3rd featured a better than expected jobs number, and off it went. 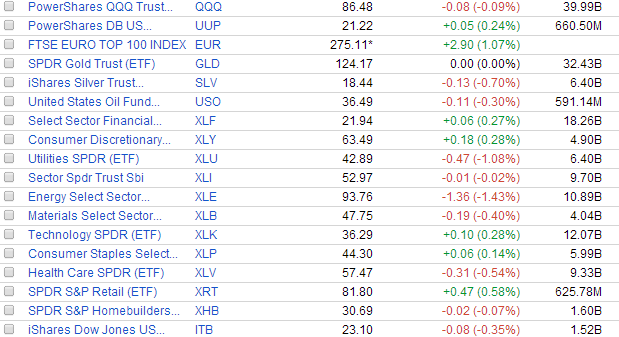 The last green bar was on options expiration last May and then things got wild. There are correlations to volatility and the option expiration cycle, and there are correlations to volatility and seasonality. I will go into these frequently in the newsletter. Today I added a few VXX May 30th $38 calls for 2.35. 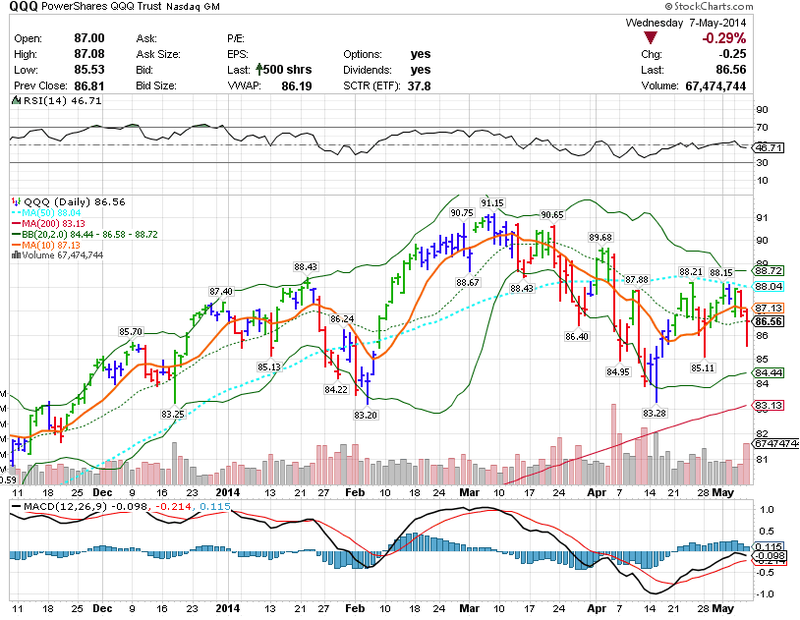 Tomorrow is the day that I was targeting to add more considering the performance of Tuesday in the markets this year. 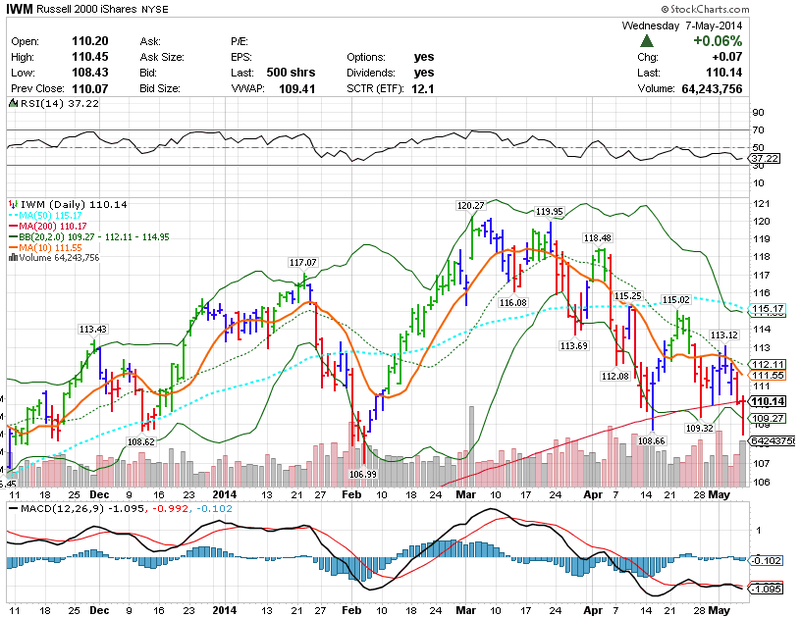 It has been an automatic ramp on Tuesdays, so it may offer some nice prices to get long vol. In part one, we looked at the ranges of different sector VIXs, compared the S&P VIX to a similar past time-frame during a mid-term election cycle, examined the current VIX futures contango structure, and did some rough calculations of negative roll yield in the current structure. Now we want to examine some trade set-ups to take advantage of a low volatility environment. The main premise of these set-ups is two-fold: A. That volatility can go higher in the next month or two due to seasonal factors, and because volatility is at the low end of the range, thus risk is under-priced. B. That these trades can be set up with an asymmetric risk/reward scenario; that the risk of loss is far less than the potential for gain. So if you believe the VIX structure will remain in this format, here are some projections for VXX and UVXY prices at future points in time taking into account the negative roll yield. 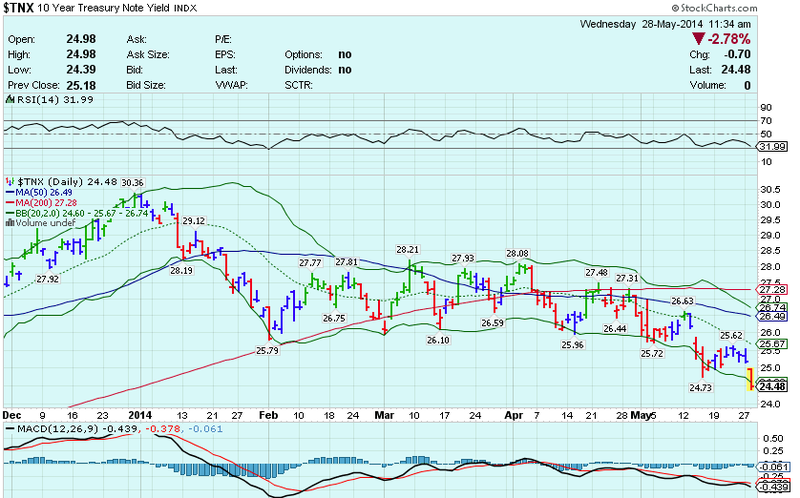 In 5 trading days the VXX will be roughly 39.52, in 10 days 39.03, etc. The UVXY decays twice as fast, relative to its current price. One put spread example would be to sell VXX put spreads for next week or the week after at a level that would take into account the negative roll, and gives you some wiggle room for a shift down in the VIX futures of 1 or 2 percent more. For the May 23rd expiration (May5), the VXX 38-37 put spread can be sold for roughly a .25 credit, whereas 15 days of negative roll only get you to $38.55. 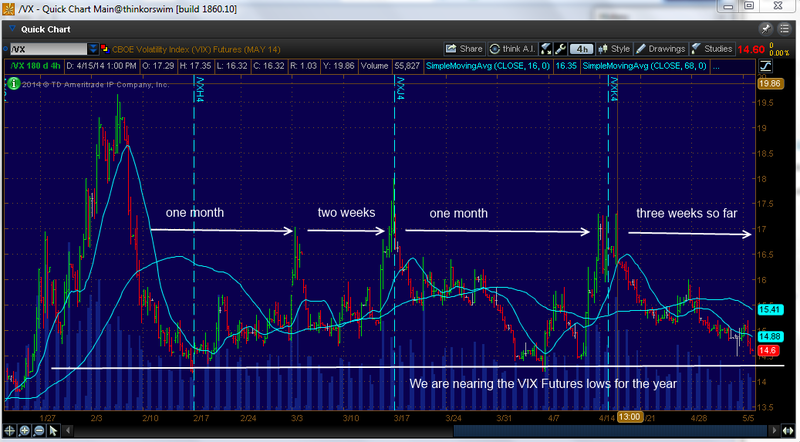 If the futures curve fell around 2%, that would equate to a VXX price of roughly the $38.55 less another 2% or 37.75. Thus, it would take not only a significant drop in vol from here for this trade to lose , but there could be no hiccup in the market during this period. If the S&P saw any selling, the VXX simply cannot get to this price. The odds are that you will keep the premium. This same method can be applied to UVXY, at say the $50-48 levels. Again, knowing that the VXX will have a tough time falling below $38 in 20 trading days, you could purchase the May 30th VXX $37 calls for $3.35 debit. At risk over the next two weeks is realistically around $1.50 of that $3.35, but if the market sells off between now and May 30, the upside could be 100-300% of your real risk of only $1.50 per contract. It would be up to you in two weeks to reevaluate how you see the next two weeks after that playing out, and adjust accordingly, if you hadn’t sold them by that point. 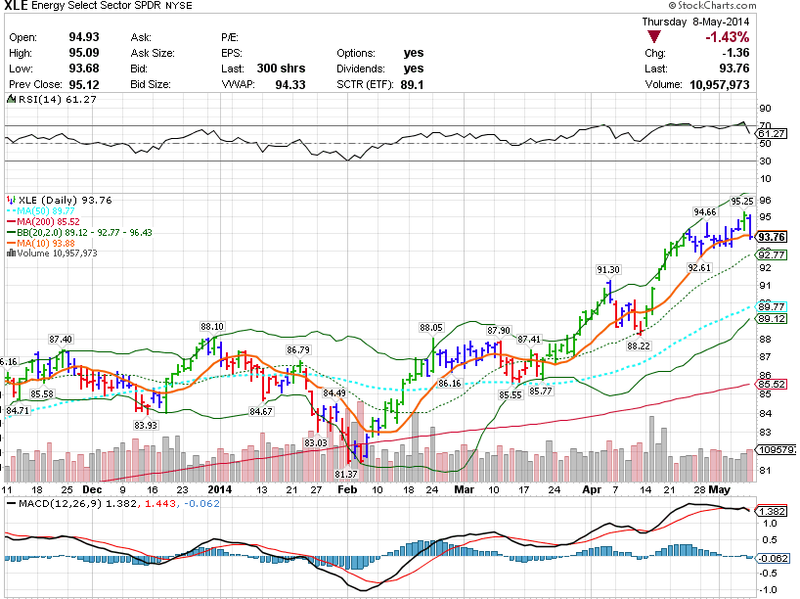 If you suppose that this week will be a quiet one, but there are storm clouds on the horizon, you could sell the May 9th $41 call for .45 Â or the $41.5 call for .35 and buy the May 23rd $38 call for around $2.50. Now you are long volatility for no premium paid, essentially $2 which is the current VXX price, less the strike price of the long call, $38. Another advantage of this trade is that you can sell against it again at the end of this week to further cut into your cost of the long call. 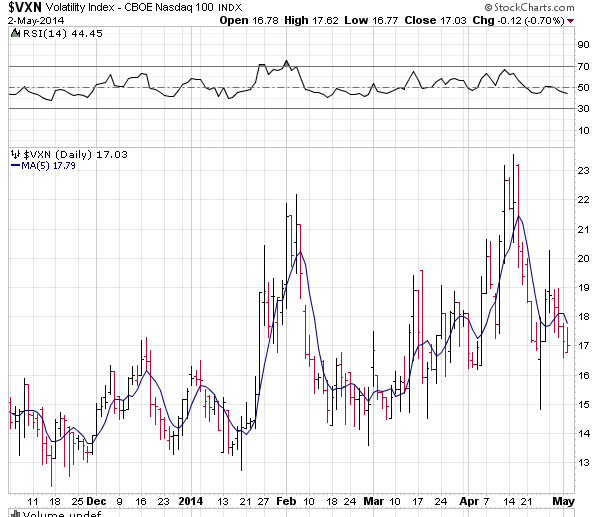 Also, if volatility rises between now and Friday, diagonal spreads benefit by rising volatility or vega. So there are three ways to get long vol without paying high premium in VXX or VIX calls. The odds are with you on these trades, whereas buying out-of-the-money calls on the VIX and VXX as many people do is a consistent losing strategy. I will be starting a volatility forecasting and signal service shortly for $25/mo if you are interested, and that will also include an email service with real-time trades, and a weekly newsletter breaking down the volatility landscape. There will also be sections with basic option trades and education, ETF analysis for straight trades on volatility, inverse and leveraged funds, and profit loss diagrams. Imagine what you see here and a lot more. Email me at scottmurray1 (at) gmail.com if you are interested. But now, just as then, a simple strategy can be almost as profitable as long as you exercise patience and know your math in the volatility ETN’s. Volatility that remains in a firm low range for long periods is not rare, although folks on television frequently harp about the VIX being broken. But let’s be frank, a lot of the CNBC folks do almost zero homework and regurgitate what they hear among each other as fact. 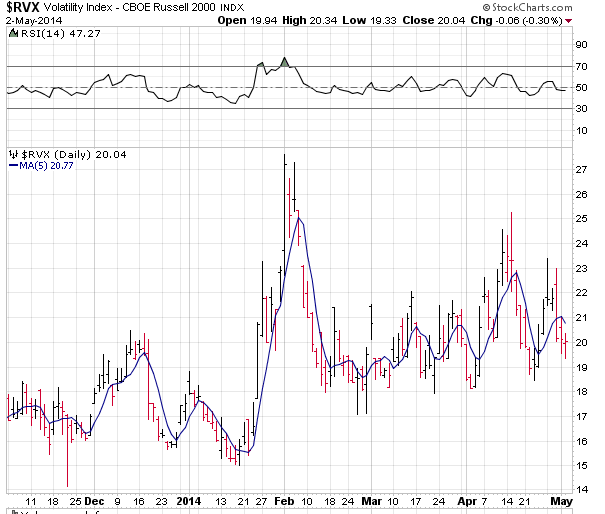 The Russell 2k VIX (RVX) and the Nasdaq VIX (VXN) both exceeded 20 recently, a fact you would never hear on CNBC. 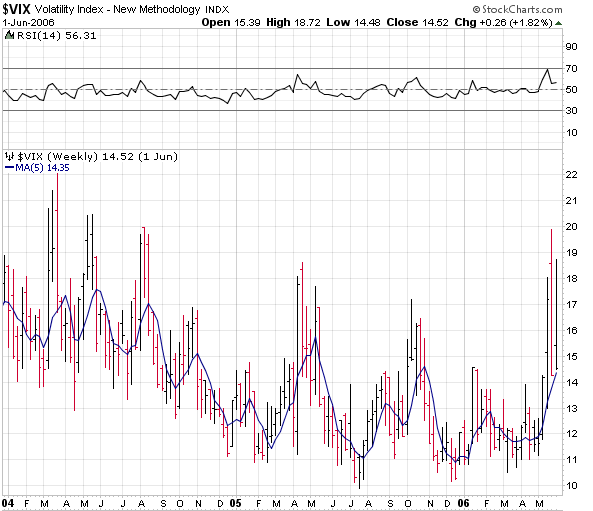 That is where the volatility was, and the implied volatilities of those indexes reflected that risk. Unfortunately for vol traders/hedgers, Nasdaq VIX and Russell 2000 VIX options were a flop. That also appears to be the case with the VXST, the short-term S&P 500 VIX options. There has yet to be any significant volume in that recently released product. Fact is there are plenty of weekly options available these days in the ETF world for hedging/trading. But, the CBOE does a terrible job of educating anyone in the media about how the VIX works, and therefore no interest or knowledge flows into what could be very useful option products in the VXN and RVX. Especially this year, as you can see in the above charts that the Nasdaq and Russell indexes have entered higher vol ranges. These are weekly VIX charts covering the same length of time. Not only that, these two charts cover the same time in the presidential cycle, ending in the mid-term election year. They are incredibly similar. In 2004-6, the internet bubble was fading into the distance, and here we are trying to forget about the mortgage crisis. 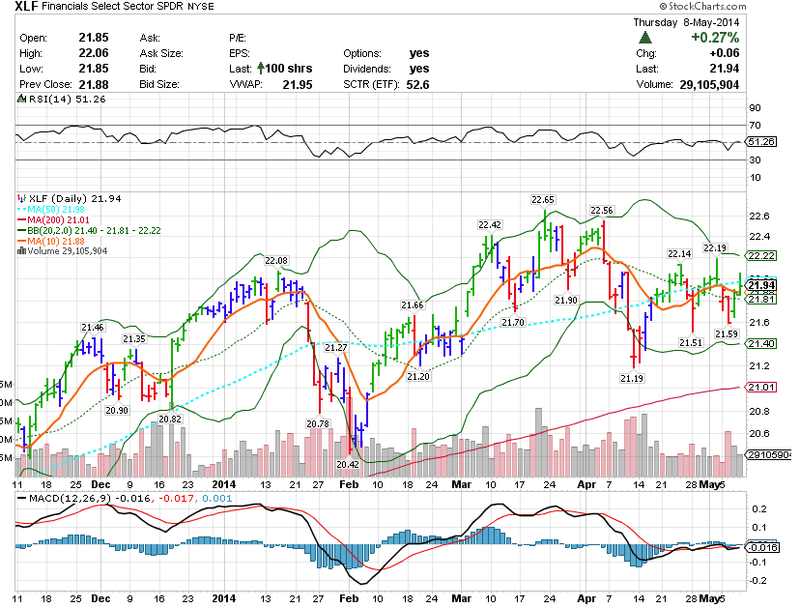 So vol never goes away, but it hibernates for weeks just to reappear again, albeit in a lower range. So if you have weeks of VIX in the 12-14 range, what can you do? Sell VXX and UVXY put spreads. .0638 (contango given in the above chart) / 25 (days in this vix roll cycle) x $40 (VXX price) = 10 cents per day of negative roll. This is what the VXX loses on a daily basis at this current structure while rolling from May to June on a daily basis. 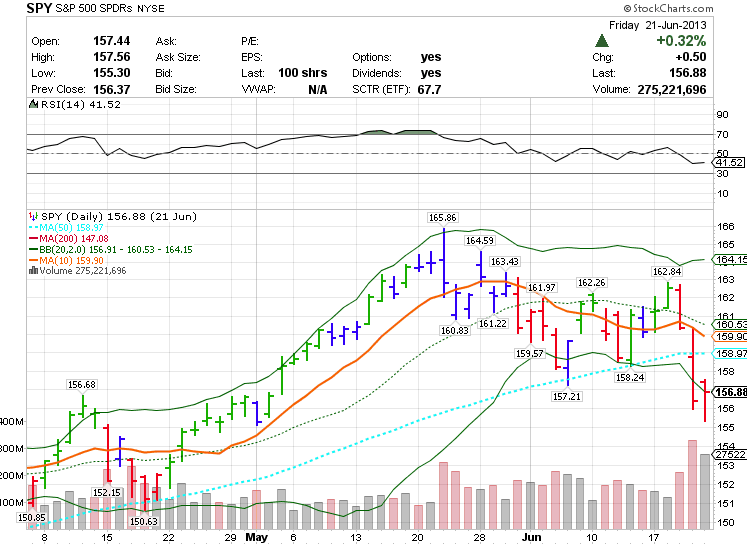 Now you know what you can roughly expect the VXX to lose over time provided this structure persists. 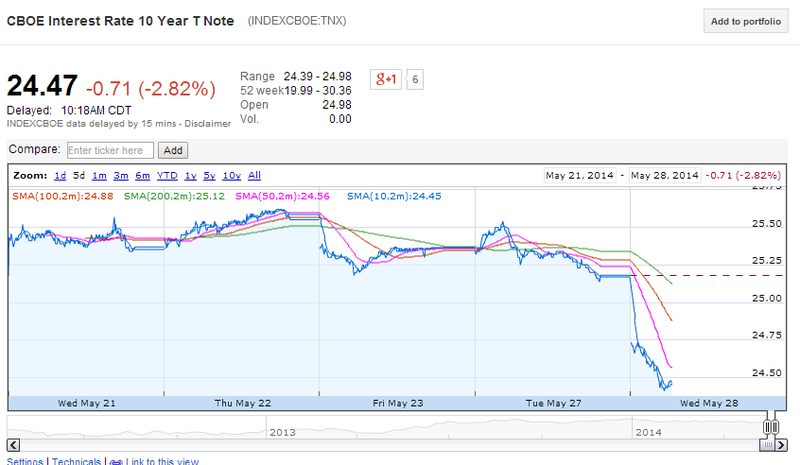 It allows you to project how far the VXX could fall. Almost 50% of each. This is important because the more expensive June future will not rise or fall as fast as the front month. So, if the VXX is heavily back-loaded or front-loaded with a majority of one option, it is far more susceptible to big moves up or down. 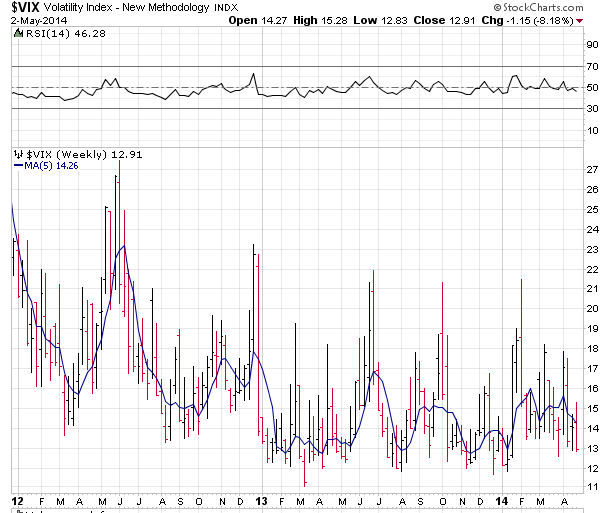 So right now, it is sort of sluggish, it does not want to move at the same speed as spot VIX. You need to know this, because generally this product moves quickest at the beginning and end of VIX cycles. Ok, we’ve laid the groundwork for the trades. Next post this weekend I will show some option chains and build some trade structures.